Guitar pedals are like cool people at parties. Everybody wants to hang out with them because they know how to have a good time. A synthesizer, let’s be honest, is the equivalent of the weird kid standing alone in the corner. Though why should guitarists have all the fun?! Luckily there’s always a happy ending to these stories. The nerd gets the girl, and synths get the pedals. You can add stompboxes into your synth rig to open a whole new world of sonic variety. Alternatively, if you’re a guitarist with some pedals lying around, you can get a cheap synth and hear familiar effects reinvigorated. What’s so great about pedals? You don’t need to be a tech whizz to have a eureka! moment combining the two. Guitar pedals can take a plain, dry signal and twist it in ways you never thought possible. Because both components use 1/4” jacks, the process is simple to assemble and achievable for anyone with a bit of space at home. If you’re a gigging musician, you can incorporate it into your live set-up for that extra wow factor. For Eurorack users, think of a pedal as another module to add to your sound. Synth keyboards usually have basic in-built effects such as reverb, delay and chorus. In most cases, they simply don’t sound as good or aren’t as fleshed out as guitar pedals dedicated to creating these effects. Pedals either have a very specific modulated voicing, or house an array of parameter controls. Or both if you pay ‘boutique’ prices. There are so many brands and combinations of effects out there, it’s unbelievable what you can discover. There are a few considerations to take into account before jumping into buying hundreds of pounds worth of kit. They are minor, but worth noting if you plan to use certain pedals. Synths produce around 20dB more than guitars. When you run a loud synth into a guitar pedal the signal can become distorted or noisy. The easiest solution to this is to turn down the volume on the synth. But you may find the noise-to-level ratio is still too great, so you’ll get background noise even at low volume. This is most common in fuzz pedals, which don’t react well to a low impedance. If you do have a pedal you think might cause problems, an attenuator or reamp will do a good job in adjusting the signal. A DI box following the effects pedals could be a worthwhile addition to boost the line level up to match the impedance of a mixing desk or speaker, especially if you have a long chain. Next, you have to consider how you’re going to incorporate all this extra gear into your setup. There are two appropriate options: create a conventional pedalboard like a guitarist, or keep them on top of the synth/on a dedicated stand. The former is great if you don’t need to change lots of settings as you can keep it on the floor, out the way. But the latter lets you twiddle and experiment on the fly, and that’s what it’s all about when using pedals with synths. Now it’s time to go wild. There are lots of directions to take here. If you have a stereo output on your synth, you may as well make use of it and opt for a stereo delay pedal for those huge ambient passages. Maybe even a stereo-only pedalboard to get the most out of your pre-existing rig. Some pedals are specifically designed to work well for synths as well as guitars. As featured in the video, the Earthquaker Devices Rainbow Machine is completely mad. Essentially, it’s a pitch shifter, chorus and echo in one but it has a unique voicing thanks to the ‘magic’ button. Think 60’s sci-fi TV shows. Earthquaker specialise in these crazy mishmash effects so check out the Afterneath reverb, and Data Corruptor for more intriguing sounds. 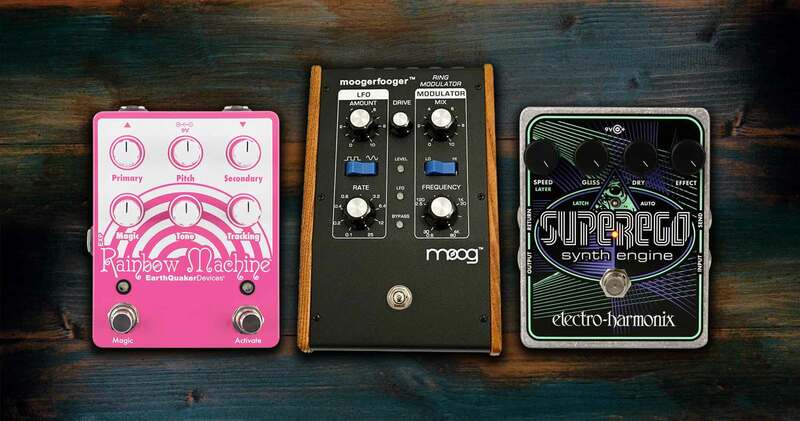 Electro-Harmonix’s Super Ego is designed to make your guitar sound like a synth. So putting this on top of a synth can only be a good thing right? Absolutely. The possibilities with this thing are close to endless. It has 11 modes and a massively reactive and expansive EQ. 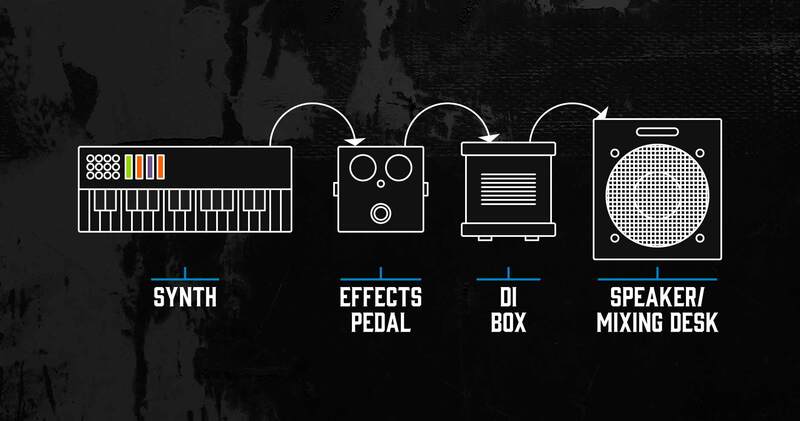 Moog have designed a large range of effects based on their synths. All analogue, MIDI-enabled, expression pedal compatible. The MF Ring Modulator is completely nuts so you’ll have to hear it for yourself, but the effects are so pristine that you could easily use it as a staple modulation in your rig. The Eventide H9 has everything you need in one small box. It combines the whole Eventide stompbox range into one compact pedal. A huge amount of effects and parameters are at your disposal including delay, pitch shifting, reverb and a whole host of modulations. The only downside is the relatively simplistic interface, so if you’re after a specific effect check out Eventide’s other pedals such as the Timefactor or Space. 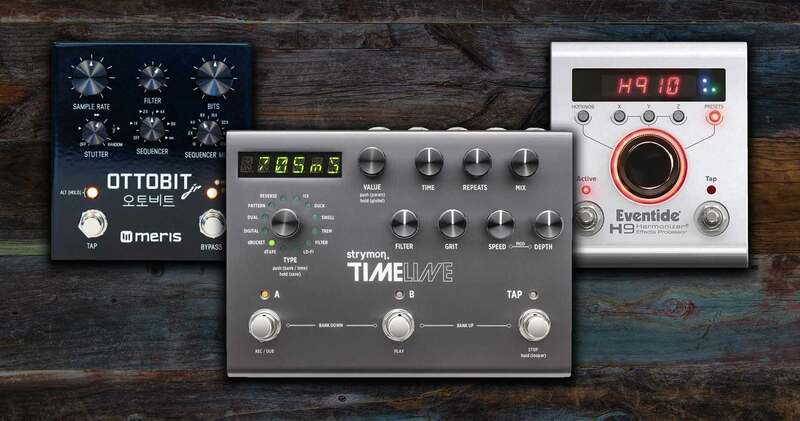 Strymon are Eventide’s biggest rivals in multi-setting FX with the likes of the BigSky, Mobius and Timeline. These are the ultimate guitar pedals and cannot be praised enough. All are designed from the ground up to work with synths too, and offer a sheen, transparent sound. Meris are known for their Eurorack modules, so know how to make pedals work well in conjunction. The Meris Ottobit Jr. in its simplest description is a bit crusher, offering those game console stutters and 8-bit noises. But as it’s based on their Eurorack module, there’s so much more to it. Use it to control swells, pitch and sequencing. Meanwhile, the Mercury7 is the perfect pedal for those ambient Blade Runner reverb expanses. As with everything else in this bracket, it’s costly, but it’s the only reverb you’ll ever need. The Electro-Harmonix Operation Overlord is an overdrive pedal designed to work with synths, which is a rare thing. It can add that little bit of dirt needed for more of an old school sound. Stereo too, so if you want to run a stereo-only setup it’ll bounce nicely with a ping-pong delay. 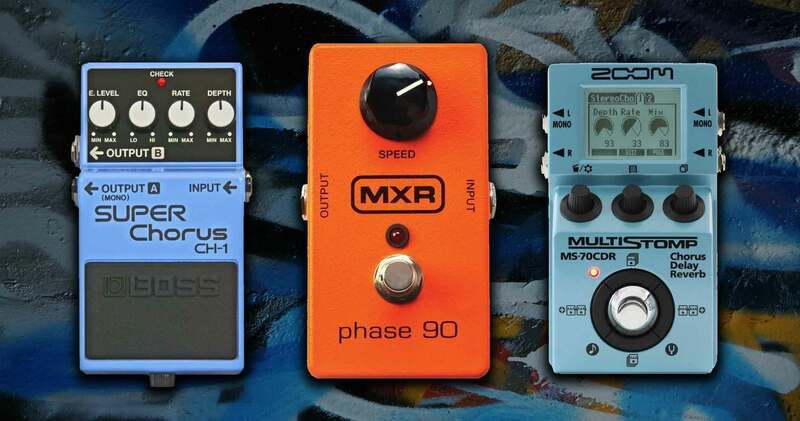 The classic MXR Phase 90 is simple, yet effective. One knob controls the speed of the phaser, so it’s not for those who love to delve deep into the variety a pedal provides, but you’ll get a straight up cool modulation. The Boss CH-1 Super Chorus is the standard chorus for absolutely anything. It’s not particularly beautiful or articulated, but it does a good job in layering and is an excellent starting point for anyone getting into the experimentation process. Last but not least is the Zoom MS-70CDR. This is a brilliant little pedal that houses chorus, delay and reverb for those on a budget. It has a massive 86 modes to mess around with, so think of it like a super cheap H9. For the guitarists out there who have no idea where to begin. You’re looking at under £500 if you want what’s considered a cheap synth. And the Roland SE-02 takes some beating. It has discreet analogue circuitry and already packs some great features, such as three oscillators, six waveforms, a low pass filter and gain-stage amplifier. The Arturia Microbrute is a great hands-on synthesizer with 25 keys, all the parameter controls you could ever need and a kickass tone. Last but not least is Korg’s Monologue. A really affordable place to start. It’s easy-to-read layout and fun effects hold your hand during the learning process. Browse Andertons’ excellent range of synths here and all the guitar pedals here. If you liked the article, check out our Labs page where we put gear to the test. Or scroll on to watch more of Jack messing around with pedals! Of course, the legendary Jim Dunlop Cry Baby sounds great through a synth. You’ll get plenty of retro vibes out of this bad boy. No messing around with knobs, plug it straight in and away you go. But how does it compare to the Nord Stage 3’s in-built wah? The Strymon Flint is both reverb and tremolo. Unlike its bigger brothers such as the BigSky and Mobius, the Flint is a mono output. Jack tests out both sides to this expansive little box. They can be used separately or together. Jack checks out the luscious MXR Univibe. This will make your tone beautifully silky smooth. And all in a compact single pedal design offering a hybrid chorus and vibrato effect. You can go from subtle lo-fi settings all the way up to big ambience or absolute silliness. In this video, you’ll see the MXR Phase 90 mentioned earlier in the article show off how good it really is. Guarantees a weighty, soup-like effect. Have you ever wanted to travel through a wormhole? Well the EH Electric Mistress can take you there with its big flange and chorus mixture. Flangers utilise the stereo capabilities of some synths extremely well for that panning effect. Jack picked the Moog Mini Ring Modulator for this test, the smaller, more basic version of the Moogerfooger. 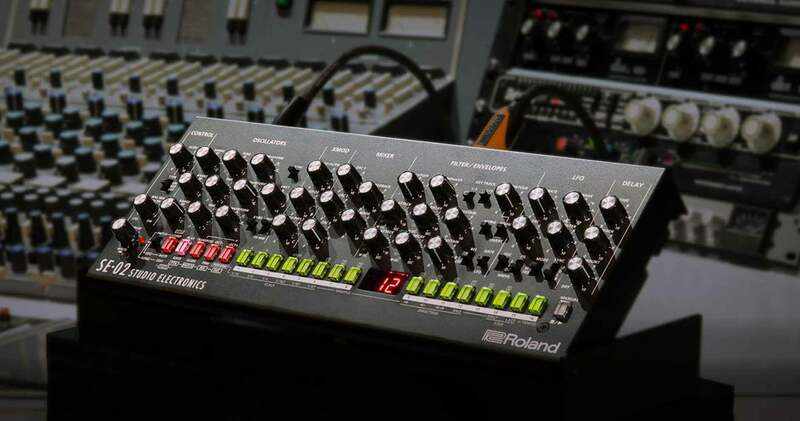 It has fewer parameters, but the same brilliant analogue sound. Get really crazy atonal dissonance out of a small stompbox. More Earthquaker Devices! This time it’s the Spatial Delivery. And again, like the Rainbow Machine, it’s a crazy pedal. You can get loads of sounds out it thanks to a Hi/Lo pass. Just watch out for the line levels with this one.